I’ve always been a reader. And in high school I was a bit of an over achiever. However, there were a few books that I was assigned in school that I just could not bring myself to read. I tried and just could not get into them. One of those was “Tess of the D’Urbervilles”. However, I decided last year to give it another chance. I reread it and loved it. I just don’t think it was the right book for kids in high school. I know I wasn’t ready for it. 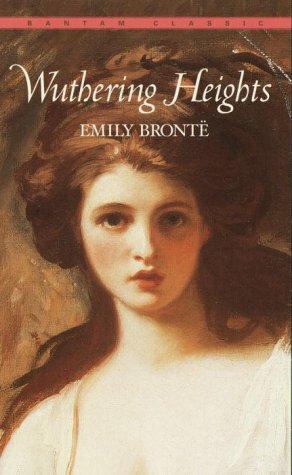 Another book that I could not read in high school was “Wuthering Heights”, by Emily Bronte. I cheated and read the Cliff’s Notes because I just couldn’t make my way through it. So, in the continuation of my “give books I hated in high school a second chance” goal, I just finished “Wuthering Heights”. And, as with Tess, I liked it much better this time. “Wuthering Heights” is a story of love, revenge, and the ghosts of memory involving two families over three generations. It is told through the eyes of Ms. Dean, the housekeeper of Wuthering Heights. The trick to the book is to really make a mental note of all the characters as they are introduced and to pay attention to the relations. Because, this is a multi-generational book and a lot of the people have the same names as their parents, which can get confusing. But generally speaking, the book centers around Catherine and Heathcliff. It is funny to me that they are often referenced as a great romantic couple, because their tale is terribly dark and they aren’t ever a couple in any official way. I love that section. “I cannot live without my life! I cannot live without my soul!” It is just so heartbreaking. Heathcliff was pretty wicked before, but becomes even more so after the loss of Catherine. He spends the rest of his life scheming and wishing ill on the next generation. The highlight of the book for me is the great drama and emotion of the characters in love. It generally doesn’t go well for anyone in this book, but the characters are all insanely passionate. Passionate, poetic, and single minded in a way that I think must be related to the time period the book was written. Perhaps when you only ever see a dozen people in your life, you are bound to be more intimately attached to them. Though I didn’t love the book this time, I did enjoy it. I’m glad that I am now in the know with all the references made to this book. And I’ll add, it wasn’t a read that left me feeling relaxed and satisfied. It was awfully dark. In fact, after I finished it, I read another one of the “Southern Vampire Series” to lighten my mind. So this is your warning, you might need a cheesy book after Wuthering Heights. This is really interesting, You’re a very skilled blogger. I’ve joined your feed and look forward to seeking more of your wonderful post. Also, I’ve shared your site in my social networks! great points altogether, you just gained a emblem new reader. What could you suggest about your submit that you simply made some days in the past? Any certain? I like the helpful info you provide in your articles. I will bookmark your weblog and check again here frequently. I’m quite sure I’ll learn plenty of new stuff right here! Good luck for the next! My name is Katie Cox and I love to cook. On my blog I keep track of all the fun recipes I make, books I'm reading, and artwork that I'm creating. I hope you enjoy it and come back for more!